I ordered dance matrials from this site couple times.The service was excellent, very good customer service and I would recommend this website to all my dance mom friends. Hello, I received the package today. The jewelry set is really cute and we all love it. Fast shipping and great service. I just received my dress and I would like to thank you for a great service and for the quality of the items – they are superb! And additional thank you for bindis! Bought this belt for my daughter. The quality is good. Kind of heavy but other than that it is really good piece that will complete the dress up. Like the customer service and very fast shipping. Already recommended to fellow parents. Thanks for the prompt action on our order. You were very friendly and the order items were delivered as required in timely manner. They were nicely packed too. We will definitely recommend your web site to our friends. I received my order in 4 days. This belt is amazingly light weight and strong. Little big for my 8yr old, but beautiful !! I love this. The packaging is good. I got it on the 4th day ! I would like to congratulate Your company in providing first class service for my daughters dance costume. The communication, updates, materials, and postal service I received was second to none. You provide a world class service and I would urge people to put trust in you for an excellent outcome. It is a difficult decision using an overseas company for the first time and I must say I used the reviews already given as guidance which makes me write this to assist and guide other first time customers to come to a decision to go ahead with orders. The team are very helpful and pleasant and delivery was top class and very quick indeed!! Thank you once again for a great service, I will definitely use this company again. I am very pleased with the prompt service and communication with regard to my order. I will definitely recommend this site to my friends who require bharathanatyam accessories, and will continue to shop at this site if I need additional items. We received items on time. Fast shipping and good customer care. I would do business with you guys definitely. I received great service and the shipping was very fast last time I ordered. The staff are efficient people and the variety of their merchandise is very helpful to people living in North America. Thank you for the great service and products! I will definitely return to purchase again. Hello, I really liked your fast delivery by FedEx. Even though I have selected 4 business day delivery I got it the second day. Also all the jewelry and accessories are nice quality. We will tell our friends here.. Liked your fast delivery and the product quality. Appreciate your reliable services for our daughters Bharatnatyam dance needs. Great service. Extremely satisfied with their quick delivery and very prompt response. Will definitely come back for my Bharatanatyam stuff! The necklace is beautiful. Thanks for the timely delivery. My shipment took almost a week to arrive. One item was broken, but they sent one with a free shipment. By the time i got it, my program was over. ClassicalDanceJewelry.com website is maintained and operated by Astral Comm LLC, the parent company of DanceCostumesAndJewelry.com, ClassicalDanceCostumes.com and IndiaMartInUSA.net. Through our online store DanceCostumesAndJewelry.com, we offer all types of Indian jewelry, Temple jewelry, Dance Jewelry, dance costumes, fashion jewellery, antique jewelry, kundan jewelry, and dance make-up accessories. We have many different models of temple jewelry and ankle bells for all types of dance forms. We are based in Indiana, USA and so the shipping time for any states within USA is only 3 to 4 business days. If you need them quickly, we can even deliver our products to you over night. We also offer Ayurvedic Herbal beauty care products, Indian traditional dresses and classical music accessories. We also offer services like Bharatanatyam costume stitching, readymade dance practice dresses stitching for all Indian classical dances, Mohiniyattam dance costumes, readymade Kuchipudi dresses and readymade Bharatanatyam costumes. Stitching is done in India and our tailors are well experienced in the field of dance costume stitching. You will see many different temple jewelry designs and Bharatanatyam costume designs for adults and kids in our online shop. We also sell all the hair make-up accessories for dance and belly dance jewelry and costumes. We have Ayurvedic Herbal beauty care products, herbal shampoo, herbal oil, Ayurvedic oil in our store. All the ayurvedic herbal skin/hair care products and herbal beauty care products in our store are manufactured by established and experienced Ayurvedic companies. We also sell Antique jewelry, Temple jewelry, fashion jewelry, kundan jewelry, polki jewelry and one gram gold jewelry from our online store. The jewelry used for Bharatanatyam dance and kuchipudi dance is commonly known as Temple Jewelry. There are different types of temple jewlery. The most authentic and expensive is made in the southern part of India by Artisans who s family is doing this for centuries. This is made of real Silver and plated/coated with Gold. We also have imitation temple jewelry which is less expensive than real temple jewellery. Instead of Silver, basemetal or Copper is used in this type of jewelry. Imitation temple jewelry made of basemetal is britle and should be handled with care. In the recent past, many imitation temple jewelry manufacturers are using fiberglass as base material for some ornamants like belts, jada and headset. This material is very light and strong and easy to handle. Some jewelry manufacturers use Copper as the base material, but it is heavy and expensive. 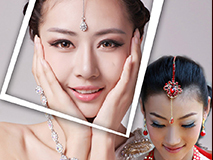 Some dancers use stone jewelry, antique design jewelry and artificial pearl jewelry for dance performances instead of Temple Jewelry. Kuchipudi dancers and some Kathak dancers use Temple jewelry for their dance performances also. Please visit us for all your Indian traditional Temple jewelry needs. 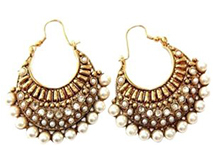 In addition to the Temple jewelry for dance and accessories, we also have online store selling Indian costume jewelry and fashion jewelry from India. There is too much variety in Indian costume jewelry. People in India has the oldest legacy of jewelry making since the period of Mahabharatha. Traces of oldest jewellery were found from the Indus valley civilization. Today we have different styles of Jewelry - Kundan jewellery, Lack Jewelry, Antique jewelry, Hyderabadi pearl jewelry, Polki jewelry to name a few. The most popular and traditional style of Indian jewelry is Kundan Jewelry. This is has been popular from the days of Moghul Kings and Queens for centuries. This style of jewelry has an antique look and mostly made of silver or copper base metal then gold plated. The earrings and head set(tika) are part of the jewelry set. Eventhough the traditional sets are heavy, light necklaces are also used as formal wear. The second most popular type is the lakh jewelry and is hand made from start to finish. Most of the lakh jewelry has enamel finish and pearl or bead chains. The earrings come with set some times. Indian folklore believes that Lord Brahma formed the Fifth Veda Natya Veda, an essence of the other four Vedas. After creating this Natya Veda, he gave it to sage Bharatan and asked him to popularize this Veda on earth. Following the words of Lord Brahma, sage Bharatan wrote Natyashastra or the Science of Dance, a great, comprehensive work on the science and technique of Indian drama, dance and music. Bharatanatyam got its name from sage Bharatan. The dancers and professionals still follow this material to learn and perform. In Indian folklore, Lord Shiva is the supreme lord of dance. Dance preformed by Lord Shiva is known as Tandava, which portrays his violent nature as the destructor of the universe. The Tandava performed with joy is called Ananda Tandava and performed in violent/angry mood is called Rudra Tandava. Tandava has vigorous, fast movements. The dance performed by Goddess Parvathi is known as Lasya, in which the movements are gentle and graceful. In olden days Bharatanatyam was performed mostly by Devadasis, who would perform in the temples. These Devadasi were proficient artists who would sing, dance, play many instruments. They were fluent in Sanskrit & other local languages which helped them to infer compositions which they would perform. Then dance entered the palaces. Here the artists called Rajanarthaki, performed in the courts of kings. Bharatanatyam jewelry is widely known as Temple Jewellery. The origin of Indian Temple Jewelry dates back to 12th century. Originally in olden times temple jewellery was made of gold with ruby, emerald & pearls and was used by the devadasi girls who danced in Temple and durbars. Its unique design has made it very popular and adorable. Even today, real temple jewellery is made by highly skilled craftsman. Today temple jewelry is closely associated with Bharatanatyam and Kuchipudi dance forms. Temple jewellery is admired for its beauty, wonderful artistry and unmatched craftsmanship. Bharatanatyam and Kuchipudi dancers wear temple jewellery during the dance performance. These days Temple jewellery is made using a variety of metals like silver and brass as its base. Both these varieties are then plated with gold. The ones made with silver are more expensive and preferred by professional dancers. The base metal kind is more affordable and is commonly used. In appearance both look very similar. The traditional temple jewelry set has 11 different ornaments namely the Long chain Short necklace, Sun/Moon, Nethichutti or chutti, Mattal or Matti, Jimikki, Belt or Oddiyanam, Vanki, Rakkodi, Nath/Bullakku and bangles. Dancers also wear chilangai/salangai in the ankles during dance performance. 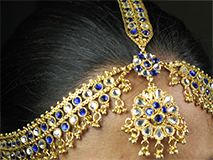 Along with temple jewelry, dancers use kunjalam to decorate the hair. This kunjalam comes in different designs and is tied to the end of the braid to add aesthetics to the hair. The ones used for Bharatanatyam or Kuchipudi dance have matching green and red stones in them. Nritham can be broadly divided into Chari, Karana, Angahara and Mandala. Movement of a leg is called Chari. Movement of both the legs is Karana. 3 Karanas make a Khanda. 3 to 4 Khandas make a Mandala. 4 to 9 Karanas make a Angahara. 4 to 5 Angaharas also make a Mandala. 108 Karanas and 32 Angaharas are defined in Natyashatra. The 13 Nritta Hastas (explained later) are used to perform nritham. The rythmic body movements along with hand gestures are called Adavus. Number of adavus constitute a Jati. Jati will generally end with a Muktaya or Teermana. Different types of Adavus are Thattadavu, Mettadavu ,Natadavu, Kattadavu, Kudittamettadavu , Maiadavu, Mandiadavu, Jati , Nadai and Aradi. There are 12 adavus in each of the above explained. Hence 120 adavus exist in total. Only about 70 - 80 are in practice. The adavus are more or less Karanas. Hence can be concluded that there are 108 adavus. The 108 Adavus are carved in the Chidambaram Temple in Tanjore, Tamilnadu, India. To perform an adavu, aramandi, bending of the knees is very important. The entire body is divided as Anga, Pratyanga and Upaanga. Shoulders, Arms, Stomach, thighs, Knee are the Six Pratyangas. Sight, Eyebrow, Eye lids, Eye balls, Cheeks, Nose, Gums, Lower Lip, Teeth, Tongue, Chin and Face are the 12 Upaangas. When all Angas (main body parts) coordinate (along with pratyanga and upaanga) the artist is said to have Anga shudhi. Anga meaning body parts and shudhi, meaning faultless. Any dancer should try to attain this flawlessness. The Natyashastra, which talks about all aspects of Bharatanatyam, quotes slokas to perform all the above movements. Arangetram is when the first public performance of Bharatanatyam or Mohinyattam dancer occurs. Arangetram is a Tamil word. It is also called Rangapravesha in Kannada. Ideally this should be the first public performance of an artist. After learning bharatanatyam under the guidance of an accomplished guru, this is the occasion for the Guru to present his/her student to the public. At least 8 - 10 years of training is necessary to give a good performance. Usually duration of an arangetram will be 1 1/2 - 2 hours. To perform for such long duration one must have good stamina and concentration. This time is divided into two halves. In the first half the artists generally perform Pushpanjali Or Alaripu, Jatiswaram, Shabdam and Varnam In the second half the focus is on Padam, Ashtapadhi, Thillana, and finaly Manglam .